Where did the summer go? It’s already over, and I go back to school this week. And while I am a little sad that summer is quickly coming to a close, I am eagerly anticipating the new school year and all of the promise it brings. I wanted to take a moment to share with you some of my favorite back to school strategies and advice. I’ve organized this blog post into small, manageable sections. Please scroll through to find what will best help you this back-to-season. The First Day of SchoolPersonally, I do not like even mentioning the word syllabus on the first day of school. Instead, I prefer to create a memorable experience for my students that shows them that they are not alone. I was first introduced to this Post Secret ice-breaker as a college student in my creative writing class. You can check out THIS BLOG POST about my go-to first day of school activity that includes a free PowerPoint. The beginning of the year is crucial for setting the scene, creating classroom culture, and establishing your policies and procedures. In THIS BLOG POST, I discuss what I feel are the most important routines to develop in the first few weeks of school. I am a huge believer in having students write the first week of school. Not only does it provide you with a baseline of their abilities, but it also is a great way to help you get to know your new students. In THIS BLOG POST, I share some of my favorite back-to-school writing prompts that you can easily use on the first day or week of school. I remember my first year of teaching: it was so tough. I didn’t have a plan or a pacing guide -I didn’t even have a textbook for one of my classes. 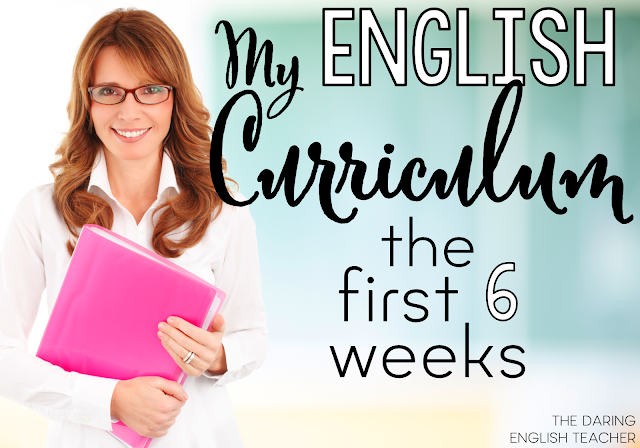 To help ease your back-to-school planning, I share my first six weeks in THIS BLOG POST. As an educator, I am always trying to improve my teaching craft. In addition to reflecting about what didn’t go so well and how I can improve, I also took some time this summer to think about what I felt were the most essential lessons to teach my students at the beginning of the school year. You can read THIS BLOG POST about the lessons that I think are essential for all ELA students. I hope that these helpful tips and links help you get ready for the back-to-school season!